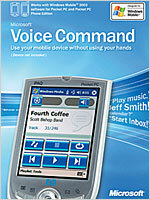 This is actually a pretty cool little piece of software, Microsoft’s new Voice Command speech software for Windows Mobile 2003-based Pocket PC and Pocket PC Phone Editions, is now available at retailers nationwide. The software provides you with hands-free access to your pocketPC phone (works with HP’s new iPAQ h6315 Pocket PC Phone Edition), contact list, calendar, digital music and more, all without requiring prerecorded voice cues. Voice Command is now available at more than five national retail outlets, including Circuit City, CompUSA and Amazon.com for about $40.